Your Location | Aero Mock-Ups Inc.
We understand the need to get airline sets to locations – wherever they may be. By air, land or sea, our sets will travel. mounted on a scissor lift in a meadow. Shipped from LA, delivered to NY and camera-ready in 22 hours. A 10’-long Service area (S1) with main entryway, lavatory and galley setup by the beach. A 20’-long, one side, two aisle Wide body cabin set up under a tent in a parking lot. a TSM – Travelling Space Museum event. One side of our MEJ (Mid size Executive Jet) “Rocky” set on a golf course in Carmel, CA, for “Lufthansa – Private Jet” exhibit. 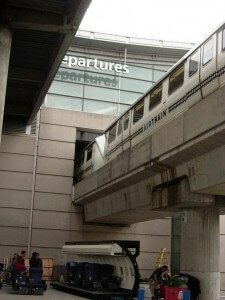 A 20’-long, one side cabin set sits ready to shoot an “Asahi Beer” commercial under the Air Train at JFK. The most challenging jobs are the most fun for the professionals at Aero Mock-Ups. Doing the out-of-the-ordinary keeps our job interesting. Other jobs we have done are, set up a cabin in a freight elevator so that party goers could travel from the ground floor to the upper floors of a travel theme Bar Mitzvah. Removed doors and dismantled sets to get them to fit into buildings. Even strapped them to a scissor lift in a field. No job is too small or too difficult. Our equipment has travelled extensively throughout North America, Canada and Hawaii with visits to Thailand, Japan and Europe. Call us with your requirements, and we will be glad to join with you to create movie magic.